Women to serve in Russian Navy submarines? Women may be able to serve on Russia Navy submarines after 2018, a source in the Ministry of Defence told InterFax News Agency earlier this month. However, the Russian Navy has denied this report raising questions, again, on the role and place of women in the Russian armed forces. Women have served in the Russian armed forces since the Soviet era. The navy, which is discussing the future role of women in the service, insisted that discussing the role of women was not discriminatory. After all, the navy has women serving in communications units, medical units and on shore facilities. However, in the cramped confines of a warship, and even more so, a submarine, it is extremely difficult to create conditions conducive for members of both sexes to function together professionally, a fact highlighted by scandals in the US Navy. Even though American ships are more advanced than Russian vessels, and take care to ensure the comfort of their crews even at the planning-design phase, they are occasionally unable to avoid unpleasant situations. It is unlikely, though, that women would be offended by the Russian army, which has prepared serious, combat-related tasks for them. 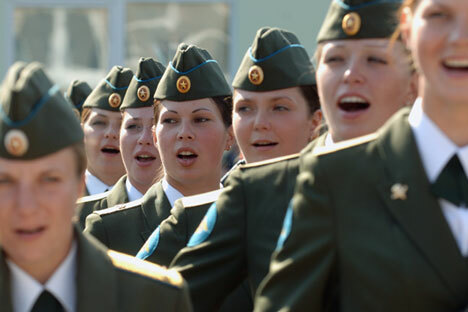 Tatyana Shevtsova, Russian Deputy Minister of Defence, said on 15 March that more than 220 women had entered military academies this year, and that the Cadet Corps comprised almost 1000 girls. "Girls who are now beginning their military education will, in ten years time, be entering the army. After a while, they will take up important and responsible posts. Our mission is to train worthy successors and prepare a real pool of talent for our armed forces,” Shevtsova said. An entire army of women is serving in the Russian armed forces, comprising more than 35,000 women. 2,600 of them are officers and 72 hold command positions. Medical research carried out during the Soviet period demonstrates that women, with the same body mass as men, are weaker than men. However, they possess psychological and physical characteristics which make them capable of a series of opportunities that are not available to their male counterparts. They have greater endurance, can withstand physical and emotional stress better, and are more meticulous and accurate. For these reasons, women in the armed forces often work in communications, in areas providing information and communication support, staff, psychological and medical services. In Russia, unlike in other armies around the world, there has never been a separation between military and non-military positions. Women wear epaulets, which mean that when ordered by their commander to attack, they attack, along with everybody else. Over the past few years, 710 women have participated in active military operations. Customs and traditions have developed which try to spare women from extreme physical danger, both on the battlefield and off, in times of peace. During times of war, a commander tries to avoid sending women to the frontline unless absolutely necessary, and in peacetime, can forgive them for wearing make-up or jewelry. In every other way, their daily life regimen and training is little different from their male counterparts. They run forced marches of 15 km, throw grenades, fire weapons of all kinds, and even test-drive tanks. The only unofficial relief for them is the absence of some forms of statutory and non-statutory punishment - military detention or heavy exercise like long runs over many kilometers, while wearing body armour or gas-masks. Women have even made it into elite units. The Ryazan Airborne Training Academy has already attracted women who will shortly become officers and will command the parachute packing units and also help in para-drops of military equipment and airborne troops. They also have to learn to parachute, like the 383 women who are serving in the renowned 76th Pskov Division of the Airborne Forces.